Can performance targets produce better healthcare outcomes? European countries face the major challenge of keeping health expenditures under control while increasing the quality of the healthcare system. It is widely considered that this goal can be achieved by giving a greater role to market forces. As a result, a number of countries have implemented healthcare reforms to increase decentralisation and favour competition – the Netherlands, Germany, the UK, and France are some good examples. However, the extent to which public hospitals have managerial autonomy and the ability of hospitals to keep hold of their accounting profit depending on their ownership can influence the impact of a pro-competitive market policy. The literature has largely focused on the US, where having a competitive healthcare market has been the rule for decades, but a new strand focusing on the UK has recently emerged. It mostly studies the effects of the pro-competition reform which was introduced in the UK over the 2002-2006 period. This reform gave more managerial autonomy to public hospitals, and changed the reimbursement rules from a budget to a UK-specific diagnostic related group (DRG)-based payment system. In particular, payment to hospitals after the reform depended on the volume of patients to whom healthcare was provided. As prices are fixed, this created incentives for hospitals to compete in quality to attract patients. Cooper et al. (2001) found that the reform led to a decrease in mortality trends in more competitive local markets. Gaynor et al. (2013) obtained similar results for mortality in level, and additionally showed that the reform saved lives without raising costs. Overall, most prominent scholars consider that the reform had positive effects on hospital quality (Bloom et al. 2011). In a recent paper, we evaluate the effect on hospital quality of a pro-competition reform that was gradually implemented in France over the 2004-2008 period (Gobillon and Milcent 2017). This reform introduced a DRG-based payment system in both the public sector (which includes state-owned and non-profit hospitals) and the private sector (which includes for-profit hospitals). As in the UK, prices are set administratively and it was expected that the reform would induce competition in quality. Three important differences are that i) both the public and private sectors treat a significant share of patients, whereas English hospitals mostly belong to the public sector; ii) the degree of managerial autonomy remains quite limited for French state-owned hospitals; and iii) French state-owned hospitals cannot keep their accounting profit, if any. Besides, the French hospital healthcare system is based on a fixed global budget that determines the amount paid ex post by DRG. In France, for-profit hospitals in the private sector were paid fees for services before the reform. These hospitals already competed with each other to attract patients by proposing catering and accommodation services of good quality, and the reform did not significantly alter the incentives for them to compete. Moreover, as prices were not affected by the reform, it seems unlikely that patients’ propensity to choose the private sector changed. Consequently, the reform is not expected to have affected the quality in for-profit hospitals in a sizeable way. By contrast, hospitals in the French public sector were under a global budget payment system before the reform. In that sector, non-profit hospitals have a high degree of managerial autonomy and state-owned hospitals have no autonomy. Among state-owned hospitals, one can single out university establishments that receive substantial additional funding for R&D and teaching activities. Their reputation also makes them benefit from a captive demand. Hence, financial incentives to attract patients are weak and university hospitals are not expected to have been significantly affected by the reform. Other state-owned hospitals are less high-tech and not really attractive for patients. As they have no managerial autonomy, they cannot adjust their medical staff after the reform to improve their quality and become more competitive. Therefore, even if they need activity for funding since they hardly receive any complementary budget, the competition effect of the reform on their healthcare quality is not granted. Finally, private non-profit hospitals differ from state-owned ones in that they have managerial autonomy and their staff is under private labour law. Hence, they can fully adjust their labour depending on the quality they want to offer, and their current and expected volume of patients. Their budget is entirely determined by their activity. Consequently, the implementation of the reform may have triggered a clear-cut and instantaneous response from non-profit hospitals which could have been able to make adjustments to be more competitive. We evaluate the impact of the French pro-competition reform by hospital status (for-profit, university, other state-owned, and non-profit) from an exhaustive dataset of in-hospital patients over the age of 35 admitted for an acute myocardial infarction (AMI) during the 1999-2011 period. The local concentration of patients can be assessed with a Herfindahl-Hirschman Index (HHI) and local competition can then be measured with minus this index. For each hospital status, we evaluate the effect of the reform using a difference-in-differences approach, which consists of confronting the evolution of mortality in more competitive markets with that in less competitive ones after the reform. The comparison of results across hospital statuses allows us to assess the importance of managerial autonomy and reimbursement rules before the reform. 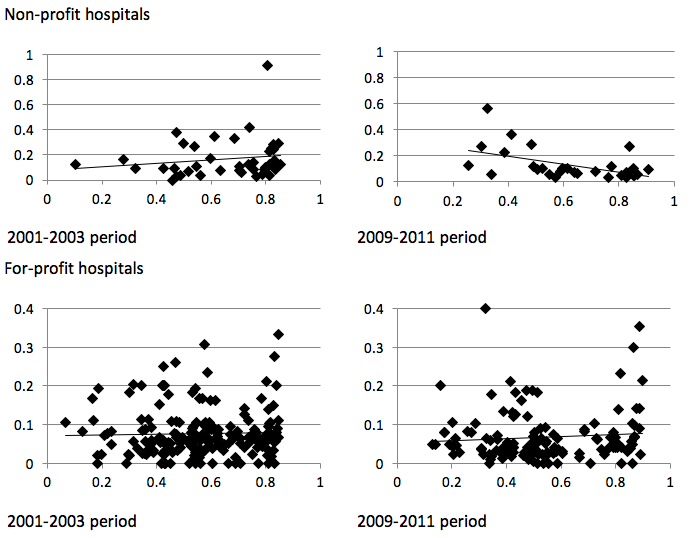 Figure 1 plots the mortality rate within 30 days for hospitals providing healthcare to at least 10 patients as a function of the local competition index before the reform (2001-2003 period) and after the reform (2009-2011 period), by hospital status. 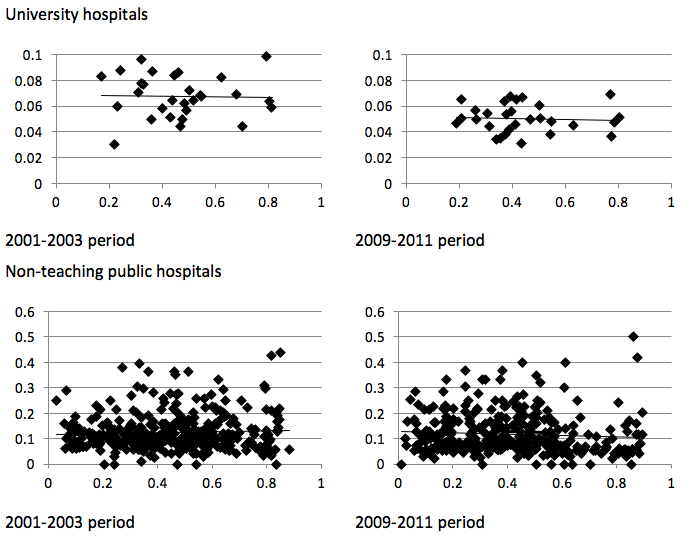 It shows that for non-profit hospitals, mortality slightly increases with our competition index before the reform, but slightly decreases afterwards. This suggests that the reform yields an increase in local competition, leading to a lower mortality. By contrast, for other hospitals statuses, the relationship between mortality and local competition has a similar slope before and after the reform, which suggests that the reform would not have affected the intensity of local competition in quality in those cases. These descriptive statistics do not take into account the composition of patients, which could affect mortality and its evolution. They also ignore hospitals’ unobserved heterogeneity and censorship in the length of stay due to transfers to another hospital or discharge. To deal with these issues, duration models for mortality stratified at the hospital level were estimated by hospital status. Results confirm the descriptive statistics. There is a competition effect for non-profit hospitals such that those located in more competitive markets experience a decrease in mortality after the reform more important than those located in less competitive markets. By contrast, there is no significant competition effect of the reform for other hospital statuses. Consistent explanations are that university hospitals do not participate in competition because, due to their public service mission, they treat at-risk patients that are not profitable for other hospitals, and they receive enough additional funding from the government; non-teaching public hospitals are unable to adjust to competition; and for-profit hospitals were already competing for funding before the reform. Finally, we proposed a simulation exercise in which we compute the probabilities of death within five days with and without a competition effect of the reform. For non-profit hospitals, the probability of death without a competition effect of the reform is larger than that with a competition effect (at 2.8%), by as much as 5.4% (confidence interval of [4.46; 6.32]). However, non-profit hospitals provide care to only around 3% of patients. For the whole sample of patients, the probability of death without a competition effect of the reform is larger than that with a competition effect (at 2.8%) by only 0.16%. Overall, our results show that the effect of the French pro-competition reform on hospital quality would depend on the managerial autonomy of hospitals. Due to the French healthcare market structure, the overall effect of the reform would be limited. Bloom, N, Z Cooper, M Gaynor, S Gibbons, S Jones, A McGuire, R Moreno-Serra, C Propper, J Van Reenen, and S Seiler (2011), “In defence of our research on competition in England’s National Health Service”, The Lancet, 378 (9809), 2064-2065.
Cooper, Z, S Gibbons, S Jones, and A McGuire (2011), “Does hospital competition save lives? Evidence from the English patient choice reforms”, The Economic Journal, 121, F228– F260. Gaynor, M, R Moreno-Serra, and C Propper (2013), “Death by market power: reform, competition and patient outcomes in the National Health Service”, American Economic Journal: Economic Policy, 5 (4), 134-166. Gobillon, L, and C Milcent (2017), “Competition and hospital quality: Evidence from a French natural experiment”, CEPR Discussion Paper 11773.